Sprint to Lure Verizon & AT&T Customers with 1/2 Price Service – Good for RVers? Today Sprint announced their 'Cut Your Bill in Half Event', a program that will start later this week and end on January 15, 2015. The promotion is aimed at getting current Verizon and AT&T customers to switch to Sprint, and promises that a Sprint representative will find a compatible shared data plan with a customer's current Verizon or AT&T plan that is half the price. Upload a copy of their current bill to: sprint.com/halfprice or bring their current bill into a Sprint store. Surrender their current phones to Sprint. Sprint will reimburse up to $350 for any early termination fees or installment plan payoffs. Customers can not utilize Sprint's buyback program to receive cash for their phones and be eligible for the half price deal. Purchase brand new Sprint phones at either full price or using their financing/lease program. Activation fees are waived. You must surrender your devices, and Sprint will only pay up to $350 in ETFs and payoffs for leasing programs. If you have a higher end device, such a brand new flagship smartphone - this deal may leave you owing or taking a loss on your phone. The reimbursement is paid via a prepaid Visa card, that is shipped later - meaning customers may have to upfront the cash to their current provider while waiting for the reimbursement. The half-price deal applies to your current mobile share bill with Verizon or AT&T. So if you decide to not bring over all lines on your account, you will still be billed for 1/2 the line charge for non-ported lines. If you later want to change your data allotment, the half-price data pricing will not apply - you can only choose from then current national rate plan pricing. And the important one for travelers: Data roaming is capped at 100MB per month, and customers can opt in to be billed at 25 cents a MB while using data in roaming areas. For some consumers, this deal may make a lot of sense to save some cash. Especially in markets where Sprint has comparable coverage to its competitors and the consumer doesn't have a lot invested in their current device to worry about. 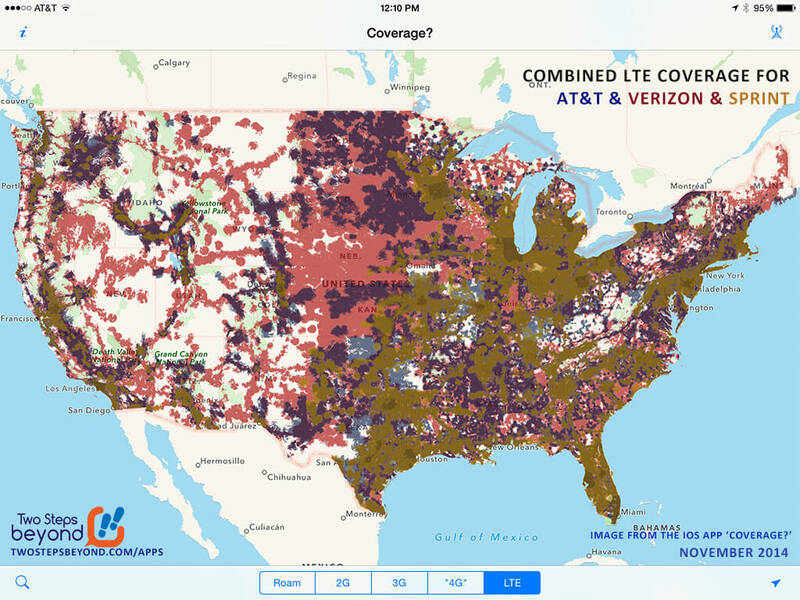 Comparing Sprint (yellow), AT&T (blue) and Verizon's (red) LTE Coverage across the nation. However, for RVers who need as much nationwide access as possible - the savings may not be worth the effort. Sprint has decent coverage in urban areas and is rapidly expanding their LTE network. However they are far behind Verizon & AT&T in consumer satisfaction and coverage. Those roaming charges above are a serious concern for travelers. 100MB isn't a lot of data, and Sprint is often roaming once you get out of metropolitan areas and off interstates. Before RVers consider this promotion, make sure you understand their coverage maps and if you'll be able to get native service (the right hand side of the graphic above) in the areas you frequently travel to.